Do you know what Cesar Millan, The Dog Whisperer, and I have in common? We both believe that in order to help your dog companions, we first have to help you! Because your dog mirrors your energy, takes on your illnesses and stressors, and because they are always reacting or responding to you — YOU are the key to creating a healthy, balanced, happy dog… or not. Are you frustrated or confused why your dog behaves in certain ways? Need to know what you can do to resolve behavior or performance problems? Keep reading. Is your dog exhibiting any of these behavior problems? Pulling at the leash – wondering which on of you is actually leading? Wouldn’t it be great if you could get inside your animals head, if you could understand them, what they are thinking or feeling? Listen to their wisdom? Share their experiences? Ask them to help you help them by becoming a willing participant in problem resolution? If you are an animal trainer, then you are undoubtedly aware that dog temperament and characteristics will only go so far in explaining the root cause of behavior and training issues. * If they actually enjoy what they are doing, or if they hate their job, or even wind up missing what their job is entirely! NOT answering these issues can cause behavior challenges — if it’s not taken care of properly. Answering these questions creates clarity for both of you and will help improve their longevity, health, and performance results. Because Val does what she does and knows what she knows given all her years of experience in working with dogs, she knows how incredibly important, even critical, it is to first communicate directly with your animal to know for sure what the problem really is, where it’s coming from, to discover the unknown factors that we don’t know yet which are contributing to the problems. But without communicating specifically and directly with your animal, you won’t know exactly what’s really going on from their viewpoint, or how best to resolve it. In Val’s extensive experience, problems could be coming from a management issue, such as food that’s not right for them or from unknown pain or undiagnosed illness, simple miscommunication or misunderstandings, improper training or handling that’s not working for them. But until Val communicates with them she won’t know specifically how to resolve the problem. If you are looking for behavior modification or an animal behaviorist, then Val is the one you are looking for. She very compassionately communicates and works directly with your dog to make sure they are heard and their own concerns are addressed so real changes and healing can begin. Watch as Val’s dog, Einstein (Genius in a Dog!) performs one of his favorite household jobs, Shutting the Door! Enjoy! And by the way, if training isn’t this much fun for you and your dog? Then we’ve got some work to do…. Do you want to learn how to talk to your dog? 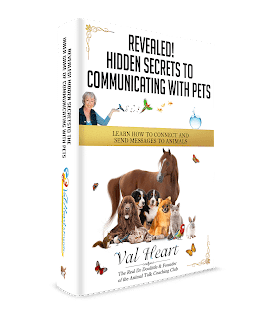 The World’s 1st Complete How To Talk To Animals, The Complete System: Core Foundation Home Study Course – for dog lovers!